Artist Joan Belmar was born in Santiago, Chile in 1970. He left Chile for Spain, at the age of 24, where he began painting professionally under the Catalan name Joan for his name John. He came to Washington, DC four years later in 1999, and was granted permanent residency in the US, based on extraordinary artistic merit in 2003. Belmar became a United States Citizen in 2010. 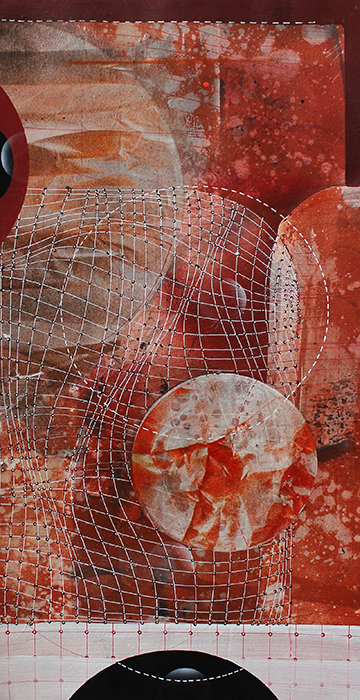 Belmar was a Mayor’s Award Finalist in 2007 as an outstanding emerging artist in Washington, DC. The DC Commission on the Arts and Humanities awarded him an artist fellowship grant in 2009. In 2011, the Arts and Humanities Council of Montgomery County gave him an Individual Artist Grant. The Maryland Arts Council awarded Belmar Individual Artist grants in Visual Arts: Painting, in 2010 and 2013. Belmar’s series of 3D works, and his series of paintings, Territories and CHORDS, have all been acclaimed by artists, critics and curators. 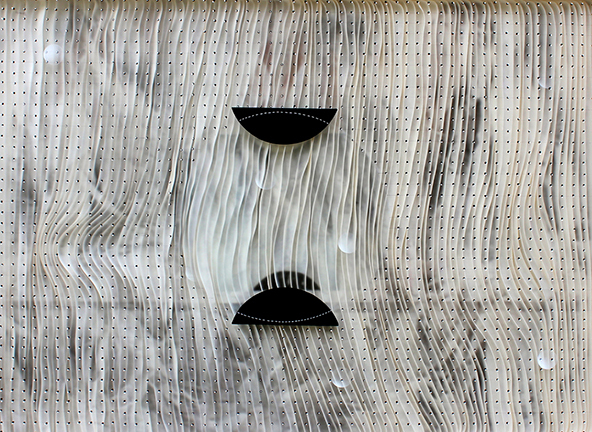 His unique 3-D paintings are created by using strips of Mylar and acetate to build up a space inside the painting. The sheer quality of these translucent materials captures and reflects light and encourages an up close viewing of the work to reveal the different layers within. Belmar’s paintings reference imaginary maps and geographical locations where color plays an important role. His work has been exhibited nationally and internationally and it is part of many private and public collections. In the last couple of years, I have been working with the properties of contemporary materials such as plastic, acetate, vinyl, polycarbonate and Mylar. I play with light, transparencies and the sculptural qualities of these elements in order to evoke the concepts that are important in my work: Time, change and movement. I have developed three-dimensional pieces maybe only an inch or two thick, using the vinyl, acetate, wood and Mylar materials to make layers within the internal space. These transparencies and 3D techniques have suited my purposes perfectly. I want the viewer to perceive some things clearly and some things opaquely. In my last series of paintings, I explore the psychological and cultural divisions that affect the way we see the world around us. My work became drawn to maps, especially as I researched the Selknam people who inhabited the southern region of my native Chile and who were exterminated in the last century. In the maps, I encountered symbols, colors, drawings, grids, dots and lines. Accordingly, in my “Territories” series, I have created certain structures, but then I let the organic qualities of the acrylics, gouache and ink mix and move spontaneously on the canvas or paper. Metaphorically, they are in search of freedom in a structured world.